He’s bad, he’s very, very bad. You know he does very dirty, very naughty things. How can you not love the guy? Well I know some of you can help it. I cannot. I see him and I get that little oh my shiver of thrill. I saw Motley Crue in concert in 1984 when I was 18. I saw them again the year I turned 40. The concert was a little more high tech 2006 but they rocked it just the same. The crowd was very much the same. The big difference was that Mick Mars was pretty stationary. He had hip replacement surgery before going on the road. So I feel like I’ve got a long history with Motley Crue and Tommy Lee. Loved him Then Love Him Now. Keep on Rockin Tommy. And just for fun one of my favorite songs by the Crue back in the day. Only 44 more days until I leave for the race in Atlanta. A quick note on the number 44 as it relates to Nascar. 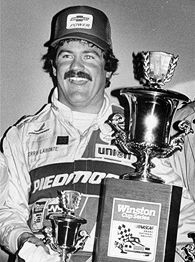 Terry Labonte drove the #44 car in 1984 when he won his first Cup Championship. Here’s a picture of Terry back in the day. On a personal note, I graduated from high school in 1984 and at that time had no interest in Nascar my how times have changed.